The measles, mumps, and rubella (MMR) vaccine is recommended for all children as it protects them against three of the most severe illnesses. This is a two-part vaccination and must be given to children before they enter school. However, if you’re an adult who has not yet had the vaccination or the disease, you may need to take the MMR vaccination too. At Apollo Clinic, we understand the uncertainty of illness and the importance of vaccines for children; and are therefore committed to supporting you and making sure that your child receives the best medical treatment. Measles, mumps, and rubella, are diseases that are severe and are quite common among children. Measles in children start with fever, a runny nose, cough, conjunctivitis and some red rashes that initially appear on the face, and later spread to the rest of the body. Sometimes, the virus also infects the lungs. Thus, causing pneumonia. Measles also affects older children, the effects of which can lead to inflammation of the brain, causing seizures and brain damage. The mumps virus is one that causes the glands below the ears to swell, giving one the appearance of chipmunk cheeks. The symptoms of mumps include fever, muscle aches, headache, tiredness, loss of appetite and swollen salivary glands. The spread of this disease can cause complications such as swelling of the testicles or ovaries, inflammation of the brain or tissues covering the brain and spinal cord, deafness, and sometimes, even death. Rubella, also known as German measles is one that causes fever, rash, headaches, sore throat and itchy eyes. It also causes swelling of the glands behind the ears, and in some cases, causes the swelling of the small joints. While most children recover quickly from this disease with no lasting effects, it can be devastating for pregnant women as there are chances that her baby will be born with congenital disabilities, a few of which include deafness, blindness, a heart defect or mental retardation. The MMR vaccine schedule is as per update by the Indian Academy of Paediatrics (IAP 2014) and is a two-shot series that is usually given during childhood. A child must receive the first shot of vaccine- MMR1 when he is 9 months, and the second- MMR 2 when he is 15 months of age. The MMR vaccine fights against diseases such as measles, mumps, or rubella that can be life-threatening. 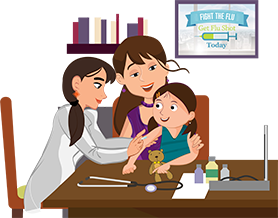 A few problems caused by the vaccine include mild fever or rash, swelling of glands in the cheeks or the neck, temporary pain and stiffness in the joints, an allergic reaction, low platelet count, or more. However, most people who receive the MMR vaccine do not experience any side effects and the benefits of the vaccine far outweigh the potential risks. We, at Apollo Clinic, understand the importance of your child’s health and provide vaccination services for children, one of which includes the MMR vaccination that will help build the immune system and prevent your child from measles, mumps, and rubella. Offering immunisations for children, we aim to ensure that your child is safe from diseases and lives a healthy life.